When I first saw the new Fat Quarter Shop Nail Polish Quilt Pattern I knew it was perfect for my girlie girl Frankie. There's nothing she loves more than going for a mani-pedi, unless it's looking at cute manicures on Pinterest! One of her favorite colors is "Pinking of You" by O.P.I.. it's a nice PINK PINK! 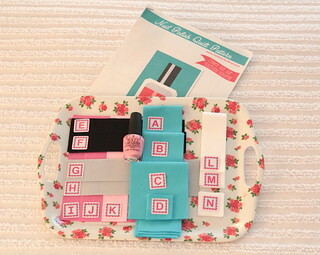 So when Fat Quarter Shop asked me if I'd like to play along with their Nail Polish Quilt Blog Hop I couldn't say YES! fast enough. With the usual great Fat Quarter Shop service, I had my order in no time. You can download the free pattern HERE!! 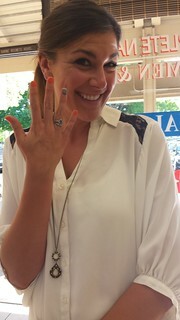 Frankie and her friend Shannon head out at lunch or after work to get a manicure for some much needed stress relief. They're two adorable girls to me, but of course I'm biased. What they are at work is two successful hard working young business professionals. I'm all set up with my pieces cut! Time to break out the Alphabitties! They really help you keep your cut pieces in order. The quilt is a snap to make, and it's size makes it easy to quilt it up yourself in an afternoon. This is the perfect time to watch the Fat Quarter Shop Nail Polish Video! Kimberly not only shows you how to make this cute little project, she demonstrates her marking technique. 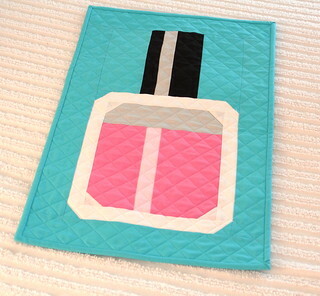 Head on over to the Jolly Jabber to find out who else is blogging about this cute quilt! Then grab your fabric and get busy! Now that is super cute!! Very, very cute! And your hard working smart business women are adorable too! I love it! Right now my nails are pink with gold glitter! Super-cute, Pam! It's such a clever pattern. I want to do mine in pinks as well. Can you tell us what shades you used? I meant what fabric colors! Love your quilt.....the pink is perfect! Look at the shade of pink! Love it against the light blue!